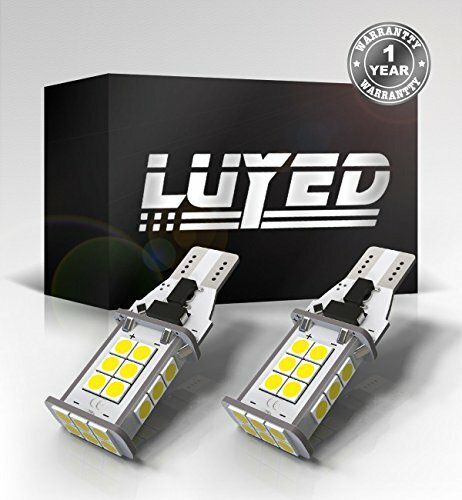 If you don't like this product, Please click the Brand name or Search "LUYED", you must be can find your favorite car LED products! √ 2Pcs 921 3030 24 SMD LED Bulbs,Working Voltage:Dc 9v-30v,Size: 1.5" x 0.6" x 0.2"
√ Color:Xenon White,Fits:912 921 906 904 902 W16W.Easy installation, plug and play. √ Application:Only Used For Backup reverse light,Built in CAN-bus error free controler, compatible for all Japanes cars like Honda,Toyota, also for American carslights,daytime running lights, ect. Common use for Car, Truck, Trailer, RV, ec,NOTE: The decoder may be needed for European vehicle to prevent flickering or dashboard error code. √ This Bulb Same Size With W16W Standard Bulb,The bulb size may vary between the model or trim of your vehicle. Amazon filter system may not be 100% accurate, The bulb size may vary between trim of your vehicle. Please double check owners manual or original bulb size to confirm before placing an order. Note:This bulb test output lumen data about 1550lumens,Real and effective without any false data,Will maximum to meet the brightness needs for your car. If you have any questions about this product by LUYED, contact us by completing and submitting the form below. If you are looking for a specif part number, please include it with your message.